Armed with a 57mm cannon and 3 Type 92 7.7mm machine guns. Armed with 47mm tank gun and 2 7.7mm Type 97 light machine guns. Other versions with single, dual, and quad anti-aircraft guns were also produced. Armed with a 75mm Type 3 Gun, and 1 light machine gun. 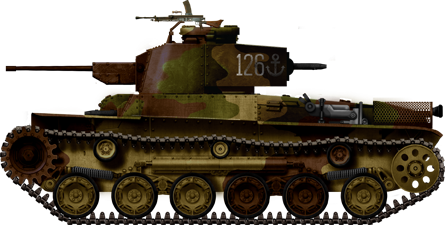 Initial version was armed with Type 3 75mm Gun, and other versions with Type 5 75mm Gun. Armed with a 75mm Type 5 Cannon, and 2 light machine guns. 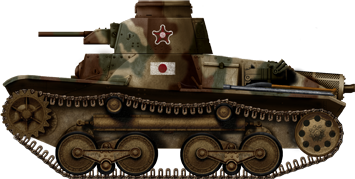 Based off the Medium Tank Type 97, Chi-Ha; the Type 97 Shi-Ki, was first used as a command vehicle, until the placement of a 37mm anti-tank gun replacing the machine gun. Armed with a high velocity 47 mm cannon. Armed with a 37mm Type 1 cannon, and two light machine guns. However, it has the ability to drive through water. Armed with 3 Type 91 machine guns. Type 2 Ka-Mi: Has science gone too far? 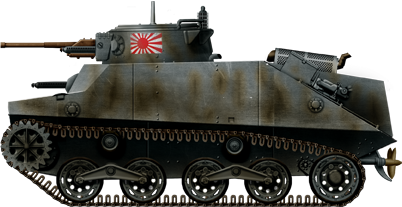 A Japanese TD line or SPG line would be cool. Even if it goes half way. It would always be cool. Noice, except that the Chi-Ha and Ha-Go w/ Chi-Ha turret should have the 57mm Tank Gun, not 47mm ; also, the Ha-Go w/Chi-Ha turret was officially identified as the Type 4 Ke-Nu. Thanks. I noticed the 47 mm too. Thanks for the corrections, but I spotted even more problem while going through it again 😛 . There’s 3 dupes of Ke-Nu’s , The first one and the third one are the same tank with the 57mm Tank Gun, while the second one should be the Type 98 Ke-Ni with the Type 100 37mm Gun (correctly labeled gun, just not the tank :P). Other problem that I spotted (although it’s a matter of opinion), the “57mm Anti-Tank Gun” on the Ke-Nu would not be appropriate , as the 57mm gun had very low velocity and barely had any AT capabilities, it fared well with T-26es and BT in Khalkhin Gol while it was mounted on the Chi-Ha , but the gun was lackluster when it when against Stuarts and Shermans, as it had no penetration what so ever (about 20~30mm with Anti-Tank ammo), so it would be better to write “57mm Type 97 Tank Gun”. 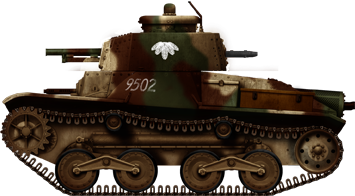 And turns out I’m not even done yet 😛 , the Type 94 haven’t received a name like the others since it was technically a Tankette, not a tank , it was also known as TK (Tokushu Keninsha -Special Tractor) and it only had a 6.5mm Type 91 MG. Japanese Tank naming system goes by the line of this – ケ(Ke- Light)/チ (Chi- Medium) and オ (O -Large) + Numbering of the tank design in the category by Iroha , a Japanese poem and syllabary ordering , similar to ABCD… hence Chi-Ha would be literally translated to Medium, model 3 (Ha is the third in Iroha ordering system). As for the Type system , its basically in Imperial Years. So Type 97 = accepted in Imperial Year 2597. 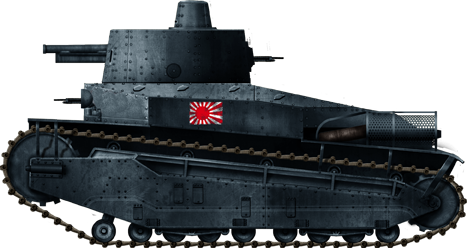 In the section called “All Japanese Tanks that saw combat IRL”, there are a number of errors..
First, Japanese never used 45mm, they used 47mm for that caliber class. Type 3 Ke-Ri used the same Ha-Go turret with just a 57mm crammed in. It was considered to cramped and thus, it never got past prototype stage. So it never saw combat. And the image is incorrect. The image is an experimentation of mounting a Ke-Ni turret on the Ha-Go hull which never received a Type year designation. Type 4 Ke-Nu also never saw combat. It was produced in only small numbers and reserved on the home island defense so it never saw combat. There’s a tank that looks like the Type 4 in Kubinka but because the hull is somewhat different than the Type 4, it’s thought that the tank in the museum was an on the field modification. 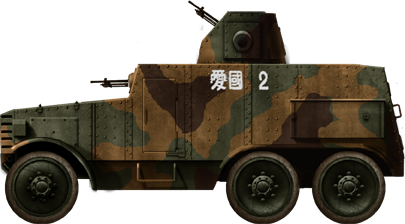 Type 3 Chi-Nu entered mass production but entirely reserved for the defense of the home islands. Since there was no invasion, it never saw action although it was deployed in the mainland so technically speaking, Chi-Nu did see service, just no action. 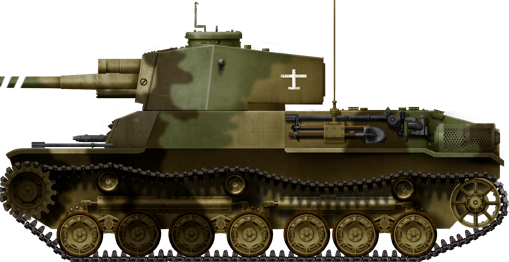 Type 4 Chi-To had plans to go into production but the war ended before productions could have rolled out. So it saw no combat and saw no service. 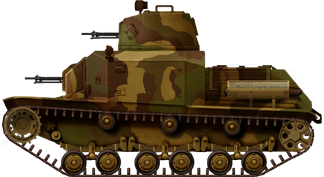 Type 5 Ho-Ru prototype was completed in June 1945 and is unknown if it managed to enter production or not. So it did not see combat and very likely didn’t see service either.